Andi Zhang was born in 1992 in Liaoning Province, China. 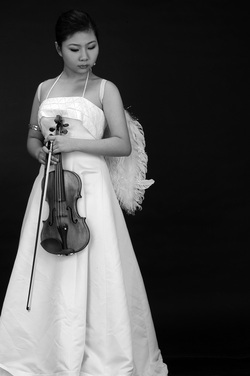 She learned violin under Hao Tie of the Dandong Song and Dance Troupe between 1996-2004. During those years, she won the first place at the Dandong City Junior Instrumental Competition, and second place at the Liaoning Province Junior Instrumental Competition. In 2004, she studied with the world famous violin master, professor Yao-ji Lin, and entered the Music School attached to the Central Conservatory of Music in 2005. In 2006 she won third place at the Eighth National Junior Violin Competition, and won the first prize at the Ninth National Senior Violin Competition in 2009. Apart from taking part in many competitions in which she has won several prizes, Andi has also been invited to play the solo concert many times and join the Morningside Music Bridge in Canada and the Meadownmount Music Summer School in USA. She has been selected to play in the masterclass of Pinhas Zukerman, Goto Midori, Joel Smirnoff, and many others. She now studies with the Central Conservatory of Music professor, Liang-Chai.